Background: The aim of this study was to evaluate the effect of ceramic material types, degree of veneer translucency, and luting cement shades on masking the underlying dark dental substrate to achieve best esthetics. Materials and Methods: In this in vitro study, 56 specimens each of 0.5-mm thickness were fabricated from two esthetic veneer materials Vita Enamic and Vita Suprinity, with two different translucencies, i.e., HT and T. To simulate the color of a dark underlying dental structure, background discs with C3 shade were fabricated using resin composite. The ceramic specimens with varying translucencies were cemented on the dark background of the resin composite with A1 and opaque white shades of resin luting cement. Color difference (ΔE) values from a reference color (A1 shade) were calculated using a spectrophotometer. The results were then statistically analyzed using three-way ANOVA test (α = 0.05). Results: The ΔE values of both ceramic systems were affected by both the degree of veneer translucency (P = 0.00) and the luting agent shade (P = 0.016). The use of an opaque luting agent and T translucency resulted in a decrease in the ΔE* values for all ceramics tested, regardless to the material type. Suprinity and Enamic showed similarity in the masking ability of dark substrate after cementation. Conclusion: None of the 0.5-mm veneers of the two ceramic systems could reach A1 shade without a detectable color difference after cementation. The change in degree of veneer translucency was more effective than the change in luting agent shade in masking the underlying dark substrate. There are numerous innovations and developments in many aspects of dentistry, but still, one of the main challenges that face dentists is to achieve an esthetically acceptable restoration. Esthetic restorations should reproduce the color and translucency of the adjacent natural teeth, to achieve no shade differences between them. The translucency of a restorative material provides the vitality and the natural look to the completed restoration. Patients and dentists always demand esthetically successful restorations, so many treatment modalities have been proposed, and ceramic laminate veneers are considered one conservative esthetic approach with adequate reflection and transmission of light together with a good mechanical strength and high biocompatibility. Laminate veneers are commonly delivered in 0.3–0.7-mm thickness out of glass or hybrid ceramics which are adhesively bonded with a resin cement to the enamel of conventionally or minimally prepared tooth structure. Shade matching of ceramic laminate veneers with adjacent natural teeth and masking the color of underlying tooth structure are common challenging issues. The color of the tooth/substrate, the thickness and type of ceramic material used, and the shade of resin cement selected are all contributing factors that affect the esthetic outcome of laminate veneers., The degree of ceramic translucency is another critical factor that controls the amount of transmitted and reflected light and directly affects the color masking ability to a dark underlying substrate which in turn affects the final veneer shade. Masking ability can be determined by measuring the color difference (ΔE) between a uniform thickness of the material on black and white backgrounds. If there is no color difference between the black and white backgrounds (ΔE = 0), the masking ability of this system is considered optimal, but it could still be regarded as visually acceptable if ΔE was ≤3.7 units. However, there is a controversy in the literature regarding the clinically acceptable ΔE values. In each clinical situation, one should decide how much translucency or masking ability is needed for optimal esthetics, and this could be decided by the shade of the underlying tooth structure or core buildup material, so the most appropriate ceramic material has to be selected in relation to each situation in terms of thickness and translucency. One way to increase the masking ability of ceramic veneers is to increase their thickness; however, this might need an increased amount of tooth reduction which will negatively affect the ceramic bond strength to the tooth structure and endanger the pulpal health. Adding opaque modifier is another way to provide masking ability, yet the resultant color may not be predictable. Begum et al. concluded in their study that the color masking ability of a 0.5-mm veneer with an opaque shade of resin cement could be similar to a 1.0-mm veneer with a translucent shade of resin cement, thus being more conservative. Calgaro et al. conducted a study to evaluate the color parameters (CIELab*) after the cementation of IPS ceramic disks of shade A1 with different thicknesses (0.5, 0.7, and 1.0 mm) onto a 2-mm thick resin substrate (shade A3.5) using four different shades of resin cements (A1, bleach, opaque, and transparent). A 10-mm thick A1 ceramic disk was used as a control, and the opaque cement showed the lowest ΔE values followed by the bleaching, transparent, and A1 cement. Only the 1.0-mm thick ceramic disks cemented with the opaque cement were able to mask the background color (ΔE < 3.7). In addition, Oh and Kim proved that the shade of zirconia restorations was most affected by the restoration thickness (P < 0.001) and the shade of the abutment (P < 0.001) which is then followed by the type of zirconia copings (Lava, Cercon, Zirkonzahn) (P < 0.003). The true effect of ceramic material types, degree of veneer translucency, and luting cement shades on masking the underlying dark dental substrate is still a controversial issue which needs more studies. The null hypothesis of this study was that the color masking ability of a simulated ceramic laminate veneer restoration would not be influenced by the change in shade of the luting cement or the change in the veneer translucency. In this in vitro study, two ceramic systems were used: Vita Enamic (Vita Zahnfabrik, Bad Sackingen, Germany) shade 1M2 and Vita Suprinity (Vita Zahnfabrik, Bad Sackingen, Germany) shade A1. A total of 56 rectangular specimens with final dimensions of 10 mm × 12 mm and 0.5-mm thickness were fabricated and divided into two groups (n = 28) according to the ceramic material (Enamic and Suprinity) and then subdivided into two subgroups (n = 14) according to the degree of ceramic translucency (HT and T), and then, each subgroup was subdivided into two subdivisions according to the shade of resin cement used A1 shade resin cement (n = 7) and opaque white shade resin cement (n = 7). Specimens were cut from the ceramic blocks using IsoMet Saw 4000 (Buehler, Illinois, USA); then, the thickness of each specimen was verified using a digital caliper (Mitutoyo, Kawasaki, Japan). Vita Enamic and Vita Suprinity specimens were first ultrasonically cleaned with distilled water for 10 min, then Vita Suprinity specimens were crystallized in a porcelain furnace Ivoclar Programat P300 (Ivoclar Vivadent, Schaan, Liechtenstein) according to the manufacturer instructions, and then, they were left to bench cool. The Vita Enamic and Vita Suprinity specimens were polished using a two-stage polishing system, especially designed for these materials. This procedure was done using a straight handpiece fixed to a dental surveyor. The prepolisher instrument was used at 7000 rpm along the samples for 1 min, then the high gloss polisher was applied at 4000 rpm for another 1 min till the surface appeared highly polished (as the manufacturer instructions), and then, the specimens were cleaned for 3 min with distilled water in ultrasonic cleaner. To simulate the color of a dark underlying dental structure, background discs of color C3, with 20-mm diameter and 4-mm thickness, were made from resin composite Filtek™ Z250 shade C3 (3M™ ESPE™, Minnesota, USA), using a mold, especially designed for the composite substrate formation. The bonding surfaces of disks were adjusted by 600-grit wet silicon carbide paper into 4.0 ± 0.01-mm thick. According to the manufacturer's instructions, for Enamic specimens, the unpolished surface was etched with Vita Ceramics Etch hydrofluoric acid gel 5% (Vita Zahnfabrik, Bad Sackingen, Germany) for 60 s, while for Suprinity specimens, the unpolished surface was etched for 20 s only. The hydrofluoric acid was rinsed off with forceful water spray, and then, the specimens were cleaned in an ultrasonic bath for 1–3 min in 98% alcohol. Vitasil silane coupling agent (Vita Zahnfabrik, Bad Sackingen, Germany) was then applied to the etched and dried surface and dispersed gently with oil-free air, and then, it was left to react with the surface for 60 s. Cementation of the specimens was done using RelyX veneer resin cement (3M™ ESPE™, Minnesota, USA) A1 and white opaque shades. A ring-shaped stopper with thickness (4.6 mm) was made for standardization and ensuring 0.1-mm cement thickness in all the specimens. The composite substrate was placed inside the ring, then the cement was applied, and the ceramic specimen with the treated surface toward the cement was then placed. Finally, force of 9.8N was applied through flat glass slab as four loads each 250 g on each corner to unify the pressure over the specimen during its cementation, so when the glass slab reaches the margins of the ring, the cement thickness in the specimen is unified (0.1 mm).,, Each specimen was then light cured for 60 s. [Figure 1] shows example of the tested samples in final shape. Figure 1: Vita Suprinity sample cemented to composite substrate using white opaque resin cement. The analysis of the color was done using a spectrophotometer Vita Easyshade Advance 4.0 (Vita Zahnfabrik, Bad Sackingen, Germany). The Vita Easyshade was set to the restoration mode and the shade A1 was selected as the reference shade to compare the selected shade to the shade of the cemented samples. As ΔE from A1 decreases, the masking ability increases. For each specimen, three measurements were taken at the center and their average was recorded. After color measuring of each sample, the Easyshade was recalibrated. [Figure 2] shows the measuring of ΔE by Vita Easyshade. Figure 2: Measuring of ΔE by Vita Easyshade. Statistical analysis to compare the differences between the groups was done by three-way ANOVA test for multiple group comparisons. P ≤ 0.05 was considered for statistical significance. The measure of the total difference of color between two objects is described by ΔE. The ΔE values were calculated for all groups by comparing the samples shade after cementation to the reference values of A1 shade. The mean and standard deviation of ΔE values of different groups of both materials are listed in [Table 1]. 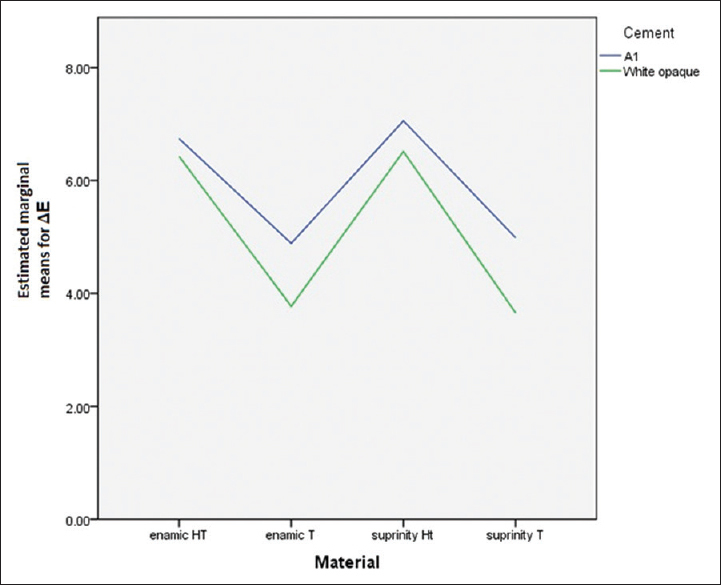 The lowest mean ΔE values were exhibited by Suprinity T samples cemented by white opaque shade of resin cement (ΔE = 3.65), while the highest mean ΔE values were exhibited by Suprinity HT samples cemented by A1 shade resin cement (ΔE = 7.05). From the results, it was found that there was no statistically significant difference between the two materials used with respect to the Δ E values (P = 0.784). There was statistically significant color difference between the T samples and HT samples in both materials (P = 0.00) and between samples cemented by opaque white resin cement and samples cemented by A1 shade of resin cement in both materials (P = 0.016). The P values of ceramic material type, degree of veneer translucency, and cement shade are listed in [Table 2]. Interaction effects between groups are shown in [Table 3], [Table 4], [Table 5]. [Figure 3] shows estimated marginal means for Δ E of different groups. ΔE ≤3.3 was considered the representative value of acceptable color difference. All groups show visually detectable color difference. Figure 3: Line graph representing estimated marginal means for ΔE of different groups. In this in vitro study, the null hypothesis that the color masking ability of a simulated ceramic laminate veneer restoration would not be influenced by the change in shade of the luting cement, or the change in the veneer translucency was rejected. Ceramic laminate veneers can be considered as one of the best treatment options used to alter the color and shape of anterior teeth with poor esthetics as discolored, fractured, or misaligned teeth. Preparations for ceramic veneers are very conservative which remain within the enamel and thus being more conservative and allow better bond strength to tooth structure than when bonding to dentine. This implies using ceramic materials with minimum thickness and increased translucency; however, they have to mask the underlying discolored tooth structure without increasing their thickness that is why our study was conducted to evaluate the effect of type of veneer material, degree of veneer translucency, and luting cement shade on masking the color of the underlying dark substrate without increasing the thickness of the restoration (0.5 mm). Two shades of the same resin cement (A1 shade and white opaque shade) were used as the first represents the desired shade to reach in our study, while the other is usually advocated in discolored areas. 0.1-mm cement thickness was used to reproduce clinical condition restoration, as recommended by some studies for stress distribution of the interface between ceramic and resin cement. Measurements were done using Vita Easyshade Advance 4.0 spectrophotometer, as it was used in many previous studies and is characterized by being accurate, fast, easy, simple, and accuracy which may reach 92.6%. All measurements were made by the same operator, in the same area, and under the same illumination factors to exclude any variation; for each specimen, three measurements were taken at the center and their average were recorded; moreover, the Easyshade was recalibrated after each specimen to ensure results' reliability. Varying degrees of veneer translucency influenced the ΔE evaluated, overall presenting higher ΔE values when high translucency veneers were used, regardless of the luting agent while ceramics with T translucency showed lower ΔE values, promoting higher masking of the darkened background. These results were in agreement with Chu et al. who concluded that there is a linear correlation between masking ability and contrast ratio. Furthermore, our results were going with Hernandes et al. who stated that the shade of HT ceramics is more affected by the underlying cement than LT ceramics. The shade of luting agent also had an effect on the color masking ability of the veneers. The use of an opaque luting agent resulted in lower Δ E values when compared to the A1 cement. This might be due to the fact that difference in color between different shades of resin cements is due to different amounts of opacity “ingredients” in the cement. Moreover, the inorganic fillers within the material represent a phase with a different refractive index from the bulk of the material, with subsequent scattering of light and different degrees of translucency. This goes well with Ozturk et al. who concluded that resin cement shade has a significant effect on the ceramic opacity and Xing et al. who analyzed the masking ability of different cement shades and stated that the impact of cement shade on the final color is more in thinner ceramic specimens and that the white opaque shade of resin cements can cause perceptible color changes. Concerning the effect of the ceramic material, it was found that there was no significant difference between the two materials in masking ability which might be due to the small thickness of the samples (0.5 mm) which minimized the effect of the material itself on the final results. In fact, it has been reported that a decrease in ceramic thickness to 0.5 mm will significantly increase their relative translucency and become more affected to change in resin cement shades. Regarding the interaction between the variables in this study, degree of veneer translucency was found to be more effective in masking the underlying discolored substrate than the luting agent shade and this might be due to the cement having only 0.1-mm thickness which is way less than that of the ceramic (0.5 mm) with an overall less effect of cement shade on color production. Further studies may be needed to evaluate the clinical implications of these findings. In some clinical situations, varying degrees of dark stains need to be masked. Therefore, the interaction between the background color and the thickness of the veneer needs to be investigated. The color masking ability of the ceramic systems was affected by both the luting agent and the degree of ceramic translucency, where the change in the degree of veneer translucency was more effective than the change in luting agent shade in masking the underlying dark substrate. Lim HN, Yu B, Lee YK. Spectroradiometric and spectrophotometric translucency of ceramic materials. J Prosthet Dent 2010;104:239-46. Volpato CÂ, Frede MC, Philippi AG, Petter CO. Ceramic materials and color in dentistry. Ceramic Materials, Ed. W. Wunderlich, InTech; 2010. p. 155-74. Turgut S, Bagis B. Effect of resin cement and ceramic thickness on final color of laminate veneers: An in vitro study. J Prosthet Dent 2013;109:179-86. Seghi RR, Johnston WM, O'Brien WJ. Spectrophotometric analysis of color differences between porcelain systems. J Prosthet Dent 1986;56:35-40. Li Q, Yu H, Wang YN. Spectrophotometric evaluation of the optical influence of core build-up composites on all-ceramic materials. Dent Mater 2009;25:158-65. Kamishima N, Ikeda T, Sano H. Color and translucency of resin composites for layering techniques. Dent Mater J 2005;24:428-32. Ozturk O, Uludag B, Usumez A, Sahin V, Celik G. The effect of ceramic thickness and number of firings on the color of two all-ceramic systems. J Prosthet Dent 2008;100:99-106. Barizon KT, Bergeron C, Vargas MA, Qian F, Cobb DS, Gratton DG, et al. 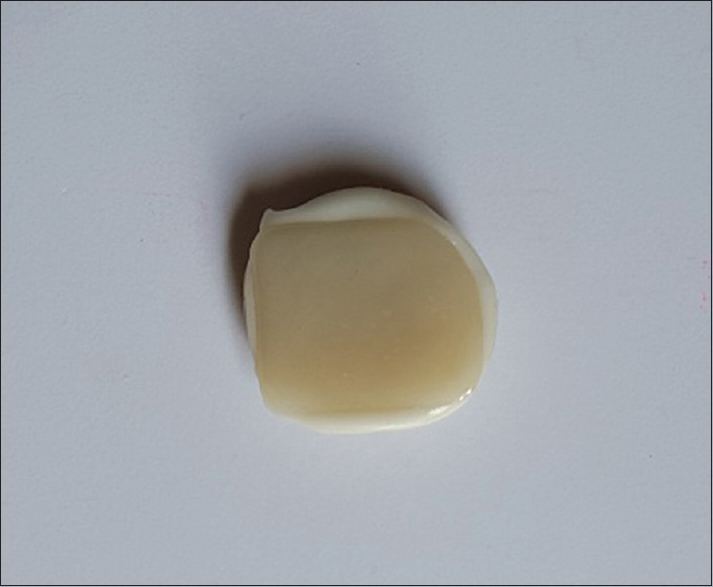 Ceramic materials for porcelain veneers: Part II. Effect of material, shade, and thickness on translucency. J Prosthet Dent 2014;112:864-70. Shono NN, Al Nahedh HN. Contrast ratio and masking ability of three ceramic veneering materials. Oper Dent 2012;37:406-16. Lee SH, Lee YK, Lim BS. Influence of thermocycling on the optical properties of laboratory resin composites and an all-ceramic material. J Mater Sci Mater Med 2004;15:1221-6. Begum Z, Chheda P, Shruthi CS, Sonika R. Effect of ceramic thickness and luting agent shade on the color masking ability of laminate veneers. J Indian Prosthodont Soc 2014;14:46-50. Calgaro PA, Furuse AY, Correr GM, Ornaghi BP, Gonzaga CC. Post-cementation colorimetric evaluation of the interaction between the thickness of ceramic veneers and the shade of resin cement. Am J Dent 2014;27:191-4. Oh SH, Kim SG. Effect of abutment shade, ceramic thickness, and coping type on the final shade of zirconia all-ceramic restorations:In vitro study of color masking ability. J Adv Prosthodont 2015;7:368-74. Vichi A, Ferrari M, Davidson CL. Influence of ceramic and cement thickness on the masking of various types of opaque posts. J Prosthet Dent 2000;83:412-7. Turgut S, Bagis B. Colour stability of laminate veneers: An in vitro study. J Dent 2011;39 Suppl 3:e57-64. Ruyter IE, Nilner K, Moller B. Color stability of dental composite resin materials for crown and bridge veneers. Dent Mater 1987;3:246-51. ALGhazali N, Laukner J, Burnside G, Jarad FD, Smith PW, Preston AJ, et al. An investigation into the effect of try-in pastes, uncured and cured resin cements on the overall color of ceramic veneer restorations: An in vitro study. J Dent 2010;38 Suppl 2:e78-86. Magne P, Versluis A, Douglas WH. Effect of luting composite shrinkage and thermal loads on the stress distribution in porcelain laminate veneers. J Prosthet Dent 1999;81:335-44. Kim-Pusateri S, Brewer JD, Davis EL, Wee AG. Reliability and accuracy of four dental shade-matching devices. J Prosthet Dent 2009;101:193-9. Chu FC, Chow TW, Chai J. Contrast ratios and masking ability of three types of ceramic veneers. J Prosthet Dent 2007;98:359-64. Hernandes DK, Arrais CA, Lima ED, Cesar PF, Rodrigues JA. Influence of resin cement shade on the color and translucency of ceramic veneers. J Appl Oral Sci 2016;24:391-6. Kilinc E, Antonson SA, Hardigan PC, Kesercioglu A. Resin cement color stability and its influence on the final shade of all-ceramics. J Dent 2011;39 Suppl 1:e30-6. Ghavam M, Amani-Tehran M, Saffarpour M. Effect of accelerated aging on the color and opacity of resin cements. Oper Dent 2010;35:605-9. Xing W, Jiang T, Ma X, Liang S, Wang Z, Sa Y, et al. Evaluation of the esthetic effect of resin cements and try-in pastes on ceromer veneers. J Dent 2010;38 Suppl 2:e87-94. Kürklü D, Azer SS, Yilmaz B, Johnston WM. Porcelain thickness and cement shade effects on the colour and translucency of porcelain veneering materials. J Dent 2013;41:1043-50.